Evanston, the county seat of Uinta County, is located in the southwestern corner of the state in the Bear River Valley. Union Pacific Railroad Chief Engineer Grenville Dodge named the town for James Evans, who surveyed the eastern half of the railroad's route through Wyoming Territory and probably never set eyes on his namesake. Evanston's first structure and business enterprise was a tent saloon erected by Harvey Booth in November 1868 as the UP tracks reached the point where they turned westward from the Bear River Valley toward Echo Canyon and Utah. But the town’s real life began in late 1870 when the railroad chose Evanston as the locomotive service and crew division point between Ogden, Utah, and Green River, Wyo. Dodge platted the town in December 1870, orienting its main streets to the railroad tracks rather than to compass points. All the streets in Evanston's core run northeast-southwest and northwest-southeast. In 1871, the UP constructed a 20-stall stone roundhouse just northwest of the center of town, to service locomotives. In addition to train crews and roundhouse workers, the railroad also employed section crews who lived in camps along the tracks and were responsible for maintaining and repairing six-mile stretches, or sections, of the tracks and rights of way. Chinese contract laborers were among the earliest residents of Evanston. They worked on section crews and as coal miners at the UP mines at Almy, about seven miles to the northwest—down the Bear River—from town. The 1880 census listed more than 100 Chinese in Evanston. In addition to being employed by the railroad, many worked in stores and restaurants. Some operated businesses such as laundries and groceries, while others raised and sold vegetables. Most of the Chinese lived along the banks of the Bear River across the tracks from downtown. In its heyday in the 1880s, Chinatown, as it was called locally, comprised several dozen residences, a community hall or tong house and, most notably, a temple—known to whites as the Joss House. The elaborately decorated temple also served as a hostel for overnight visitors to Chinatown. The Chinese staged lavish New Year's celebrations at the end of winter on the traditional Chinese calendar, including a dragon parade through downtown and fireworks. Following the Rock Springs, Wyo., massacre of Chinese in 1885, Evanston's Chinese population dropped dramatically: just 43 in 1900 and fewer than a dozen in 1920. In 1922, the Joss House burned to the ground under suspicious circumstances. Just a day or two earlier, the Union Pacific had ordered the few remaining Chinese to vacate the building. Some people in Evanston believe the UP set the fire, others think the Chinese burned the building themselves. Whatever the cause, there must have been some warning of it, for many decorative items were salvaged from the building, including the richly carved cedar wood panels that flanked the front door. The door panels now hang in the Chinese Joss House Museum, a replica of the original temple that stands in Evanston's Depot Square. The last two Chinese of the first generation of immigrants lived into the 1930s. They were Long Lock Choong, a vegetable gardener known as Mormon Charlie, and Ah Yuen, known as China Mary. Her origins were mysterious, but she was reputedly a prostitute. They died within months of each other in 1939 and were buried in the potter’s field section of the city cemetery. Soon after the town was founded, a small commercial district had sprung up in a four-block area adjacent to the UP tracks. One of the earliest businesses was the Blyth & Fargo Company, originally Blyth & Pixley, a general store established in 1872. First located on Front Street, the business moved one block west to Main Street in 1887. The Beeman-Cashin General Store took up the full length of the block on Tenth Street between Front and Main Streets; its specialty was farm and ranch supplies and equipment. Joining the commercial structures on Main and Front streets were public buildings, including the county courthouse (1874) at the northeast end and the Evanston town hall and fire station (1915) on the southwest. The UP constructed a brick depot in 1900 to replace the first wooden one. A federal courthouse and post office was built in 1905. According to local lore, the only trial ever held in the courtroom was that of a bootlegger in the 1920s. In 1906, the Carnegie Library was completed on Front Street; the building now houses the Uinta County Museum. The Masonic Lodge (1910) and the Strand Theater (1917) completed Evanston's downtown landscape. With its handsome brick buildings, Evanston was an economically and socially stable community at the beginning of the 20th century, serving as a commercial and service center for the surrounding area. While the railroad formed Evanston's backbone, the Wyoming State Hospital was also a significant economic mainstay in the community. Established by the Territorial Legislature as the Wyoming Insane Asylum, the hospital was opened in 1889 and located on one hundred acres donated to the territory by a local landowner. The hospital's older brick buildings sit on a north-facing hill overlooking the town and the Bear River. From the beginning, the hospital was a major employer in town, hiring local residents for patient care, maintenance and farm work. The older part of the campus was placed on the National register of Historic Places in 2003. Over the years, hundreds of Evanstonians have worked at the hospital, making it an integral part of the social fabric of the community. The railroad continued to shape the physical as well as the economic contours of the community through the first quarter of the 20th century. In 1897, the UP, in partnership with Pacific Fruit Company, developed an icing station between the tracks and the Bear River southeast of downtown. Water was diverted from the river into two large shallow ponds from which ice blocks were harvested in the winter and stored in long wooden storage buildings at trackside. In the summer, the ice blocks were dropped into the ends of the railroad cars traveling from California to eastern markets to keep produce cool. The ice plant operated for nearly 20 years before electric refrigeration made it obsolete. In 1912 and 1913, the Union Pacific constructed a 65,000-square-foot, 28-stall brick roundhouse to accommodate its larger steam locomotives. On its 27-acre complex northwest of downtown, the company also built a 17,000-square-foot brick machine shop and several ancillary buildings, including a brick power house with generators to supply electricity to the complex and a wooden office building. For nearly 60 years, the lives of Evanston's residents were governed by the rhythms of the steam whistle at the roundhouse complex, which sounded daily at 7 a.m., noon and 4 p.m. The expansion of the roundhouse operations coincided with the establishment of the country's first transcontinental automobile route, the Lincoln Highway. The road passed through the heart of downtown and added “highway town” to Evanston's identity. Increasing automobile traffic along the route prompted the creation of a tourist camp on the eastern edge of town adjacent to the county fairgrounds. Garages, service stations and eventually motels also sprang up to accommodate motorists. The Downs Opera House on Front Street was converted to the Transcontinental Garage in 1913. The building remained in operation as an automobile garage until the early 2000s. The first significant economic shock to Evanston came suddenly in 1925, when UP executives announced that they planned to eliminate Evanston as a locomotive service and crew change point. The news was devastating to a community where a quarter of the population depended on a UP paycheck. A delegation of determined city officials and businessmen traveled to Omaha to plead with railroad administrators to reconsider their decision. Surprisingly, the company did so. In 1926, the roundhouse complex reopened as the Evanston Reclamation, Repair and Manufacturing Plant. At its peak during the war years, the Reclamation Plant employed more than 200 people—a significant number for a town of 3,600 residents. In the 1950s, however, employment slowly dropped as diesel-electric power began to replace steam in the railroad's locomotives. By 1971, when the plant finally closed, the labor force had dwindled to about 50. Every sector of Evanston's economy felt the impact of the Depression during the 1930s. The UP cut worker hours, and automobile traffic on U.S. Highway 30, the old Lincoln Highway, dropped sharply. In 1936, a group of ranchers and business leaders in Evanston decided to create an annual event that would help boost tourism. Through the first seven decades of the 20th century, Evanston's population and economic structure remained fairly stable, growing slowly from 2,600 in 1910 to 3,600 in 1940 to 4,400 in 1970. By that time, another economic force was about to change the face of the community -- a boom in oil and gas drilling and production prompted by the oil embargo of 1973. By the late 1970s, the full-scale oil boom that engulfed all of Uinta County was beginning to transform Evanston physically, economically, socially and culturally. Thousands of construction and oil-rig workers came to town in the late 1970s and early 1980s. The 1980 census counted 8,300 people in Evanston, nearly doubling the 1970 population of 4,400. In addition to skilled and unskilled laborers, the boom attracted engineers, attorneys, physicians, teachers and other white-collar workers to the area. Evanston was transformed in a few short years from a quiet, stable, homogeneous community to a busy town with a socially and culturally diverse population. While the boom swelled Evanston's tax base and revenues, the skyrocketing population created major problems in public safety and health, housing, roads and schools. The community's leaders recognized this as an opportunity to use revenues—and the considerable resources of the oil companies in the community like Amoco and Chevron—to develop infrastructure. Some 36 companies, all major players in the industry, formed the Overthrust Industry Association in 1981, named for the Overthrust Belt, the geological formation where the oil lay. The association functioned as a nonprofit corporation, providing grants to municipalities as well as the county. With this support, the city of Evanston was able to complete a wastewater treatment plant, a general hospital, four schools, a city hall, and a recreation center by the mid-1980s. Between 1970 and 1983, the city limits increased from 2.5 to 9 square miles. Although the frenetic activity of the early 1980s had calmed down considerably by the end of the decade, Evanston's population remained substantially above its historic levels, reaching 11,000 by 1990. By the mid-1980s, as the boom began to recede, many of the established businesses downtown closed their doors, including Blyth & Fargo, which had operated for 107 years. Many buildings wore garish signs of temporary businesses or were boarded up. Determined to counteract the decline of the downtown, a coalition of Evanston natives and newcomers formed the Evanston Urban Renewal Agency. Its mission was the preservation and economic revitalization of downtown, and one of its first projects was placing the downtown district on the National Register of Historic Places. 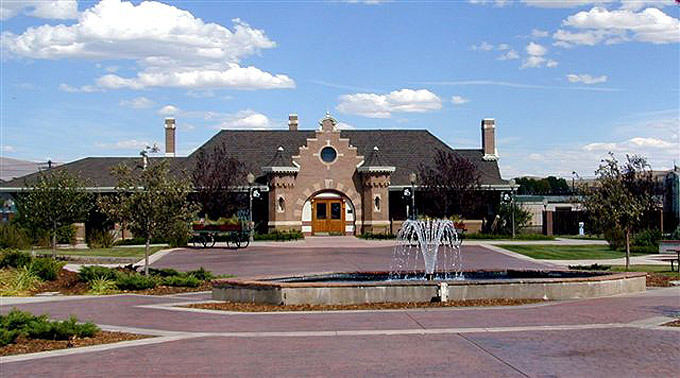 Since 1982, the agency has used more than $5 million in private donations, corporate funds and federal and state grants to restore the Union Pacific Depot, roundhouse and machine shop, relocate and restore the historic Beeman-Cashin warehouse, rescue the Strand Theatre from a devastating fire, and turn all these structures into public spaces. Paralleling the efforts of the Renewal Agency, the Better Environment and River (BEAR) Project, was established in 1983, to rehabilitate the seriously degraded stretch of the Bear River that flows through Evanston. Gradually, this group transformed a wasteland into a community park by restoring the ice ponds for recreational use and constructing a pathway and footbridges along the river to link downtown with the Bear River State Park to the south. With oil production virtually over and the oil companies pulling out by the late 1990s, Evanstonians adjusted to post-boom life. In doing so, they discovered that the newcomers brought a new vitality and diversity to the community. Although the few Chinese in the community now are recent immigrants, the town still celebrates Chinese New Year in early February with a parade and fireworks. Evanston's Cowboy Days marked its 86th year in 2012. New festivals have emerged, including an annual BrewFest in July and a Roundhouse Festival in August, and a Teddy Bear parade for children in December. Sagebrush Theatre, a community playhouse founded during the boom, continues to stage productions twice a year. During its century and a half, Evanston has experienced its share of Wyoming's boom and bust pattern and undergone dramatic changes. But its core identity persists—as a small town with strong pride in its past. Bogart, Barbara Allen and the Uinta County Museum. Images of America: Evanston. Charleston, So. Car. : Arcadia Publishing Co., 2009. City of Evanston Zoning Map, 2010. Evanston Historic Preservation Commission. “Evanston City Cemetery Walking Tour.” Evanston, Wyo., 2010. Evanston Historic Preservation Commission. “Evanston's Railroad Complex [videorecording]”. Evanston, Wyo., 2003. Evanston Historic Preservation Commission. “Gone to Gold Mountain: the Chinese Heritage of Evanston, Wyoming.” Evanston, Wyo., 2010. Stone, Elizabeth Arnold. Uinta County, Its Place in History. Laramie, Wyo. : Laramie Printing Company, 1924. The illustration of Evanston in its early days is from Leslie’s Illustrated News, via Wyoming Tales and Trails. Used with thanks. The 1942 photo of the UP machine-shop crews was taken during World War II when that workforce was at its peak. Everyone in the photo had just purchased war bonds. City of Evanston photo, with thanks to the Uinta County Museum. The photo of the workers on a drill-rig floor near Evanston is by Jon Pentz, from the collections of the Uinta County Museum. The photo of 1980s boom-time traffic clogging Main Street is by Steve Northrup of the Uinta County Herald, also with thanks to the Uinta County Museum. Evanston Chinese Joss House destroyed by fire. Barbara Allen Bogart, Ph. D., has worked as a historian and oral historian in Wyoming since 1991. She served on the staff of the Wyoming State Museum, has worked as a consultant for several Wyoming museums and historical societies, and was director of the Uinta County Museum from 2003 to 2009. She is the author of Images of America: Evanston (Charleston, S.C.: Arcadia Publishing Co., 2009) as well as In Place: Stories of Landscape and Identity from the American West (Glendo, Wyo: High Plains Press, 1995). Historic Downtown Evanston, centered at 10th and Main Streets, features four square blocks of buildings dating from the 1880s through 1930s. Downtown features include shopping, art galleries, restaurants and the Strand Theater, currently being restored as a cultural arts center. Evanston is a Main Street community. For more information call (307) 789-6320. The Chinese Joss House Museum at 10th and Front Streets in Depot Square in Evanston is a replica of the original Chinese temple (called a “joss house” by whites) built in 1874 and destroyed by fire in 1922. The museum houses artifacts from Evanston's Chinese community, including a pair of carved wooden panels dating from 1896 that decorated the original structure. The museum is free; for more information, (307) 789-8248. The Uinta County Courthouse, originally built in 1874 and expanded in 1886, became part of the structure used now when the courthouse was expanded again in 1984. The original buildings were incorporated into the new structure and are visible inside the structure's atrium. The courthouse is located at 225 Ninth St. in Evanston and is open to the public weekdays from 8 a.m. to 5 p.m. For more information, call (307) 789-0301. To learn more about early Evanston and Uinta County, and see an oil portrait of longtime U.S. Sen. Clarence D. Clark of Evanston, visit the Uinta County Museum, located in the 1903 Carnegie Library building at 1020 Front St. in Evanston. The building housed the Uinta County public library until 1986 and was expanded in 2008. The museum is free, and open from 9 a.m. to 5 p.m. Monday through Friday, and from 10 a.m. to 4 p.m. Saturdays. For more information, call (307) 789-8248. The historic Union Pacific Ice Ponds, located at 75 Bear River Dr. in Evanston were used to harvest ice for train cars carrying fruit from California between the late 1890s and the early 1920s. The ponds were restored in the 1990s for fishing in the summer and ice-skating in the winter. A walking trail from the ice ponds winds along the Bear River to connect with the Bear River State Park. For more information, call (307) 789-1770. The Union Pacific Roundhouse and Railyards Complex at 1440 Main St. lies just north of downtown Evanston. In addition to the 28-stall roundhouse, there are several other historic brick structures built between 1912 and 1913, including a 17,000 square foot machine shop and a large power plant that supplied electrical power to the complex. The buildings are being restored and refurbished for community use as an events and meeting center. A visitor's center tells the story of the complex and the people who worked there. For more information, call (307) 789-6320. Since fur-trade times, Wyoming has straddled the main travel route across North America. The Oregon and Overland trails were followed by the Union Pacific Railroad, which was followed by the Lincoln Highway and today’s Interstate 80. The routes are full of stories.